Rhythmbox uses GeditMessageArea which is old, custom widget (I guess from gedit ;) ) replaced in the recent GTK+ by GtkInfoBar. It doesn't support changing urgency of the message and uses background color which is the same as the one used in tooltips. 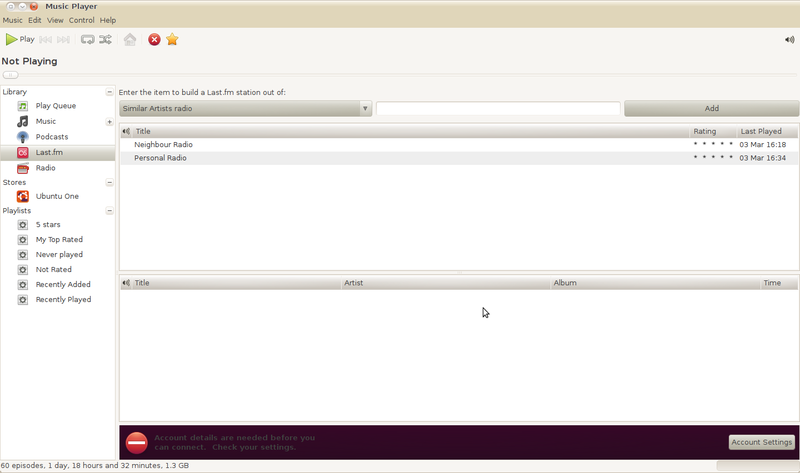 On the new Ubuntu themes the background color for tooltips is aubergine so it is used by the rhythmbox - the effect is pretty bad as can be seen on the attached screenshot. Now it may be that the GeditMessageArea should be fixed to either don't get color from tooltip or to change font color based on the theme - I'm not sure though so the bug is reported against both packages for now. I'm facing the same issue with auto-completion menu in Eclipse, and in several other places. I was able to get around it by setting the tooltip background to a light color and foreground to black. Won't Fix for Lucid updates are primarily for security-related updates.